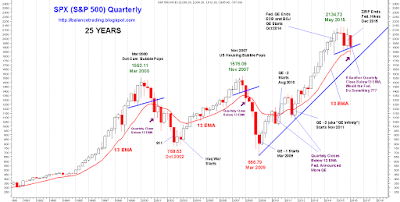 Twenty five years of trading history of SPX is shown in the quarterly candle stick chart above. Each candle stick represents a quarter. In the last 25 years, as marked on the chart, every time SPX had closed below its 13 Quarterly Exponential Moving Average (13 Q-EMA), it continued its sell off for at least four more quarters (a year) unless the Federal Reserve (the Fed) had intervened. 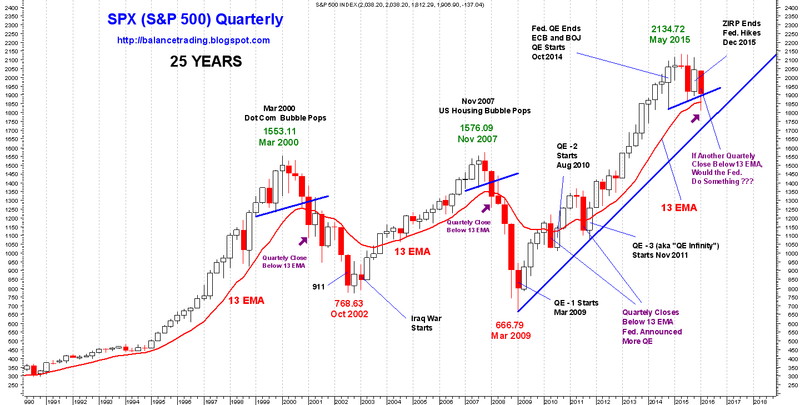 In first quarters of 2001 and 2008, for example, SPX closed below its 13 Q-EMA and continued its sell off for at least another year. In both of those bear markets, SPX corrected over 50%. The selling did not stop until the recession was ended by a massive infusion of money into the economy. In 2003, the Iraq War stimulated the economy and brought it back from recession. In 2009, the Fed directly stimulated the economy by a massive bond buying program (Quantitative Easing, QE) which stopped the financial meltdown and ended the recession. Going forward since 2009, the Fed announced another round of QE every time SPX closed below its 13 Q-EMA (QE-2 in August of 2010 and QE-3 in October of 2011). 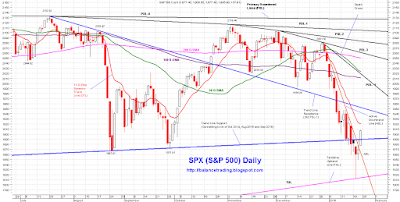 Last Wednesday, SPX penetrated its 13 Q-EMA by over 2% which was deep. My 20 year trading experience has taught me that a deep penetration (more than 0.5%) of a support or resistance signals a high likelihood of failure of that support or resistance at a near future retest. Two percent penetration is quite deep which means that chances are excellent that SPX tests its 13 Q-EMA soon and closes below it. Knowing what the Fed has done since 2009 and assuming that SPX sells off and starts trading below its 13 Q-EMA, the $64,000 question is: would the Fed intervene again? My best guess is that the Fed would come in and shore up the market once SPX sells off to test its quarterly uptrend line (shown in thick blue) around 1700. I think chances are good that the Fed would give back its December rate hike (0.25%) and would assure the market that its ZIRP (Zero Interest Rate Policy) would continue for a while, at least for the remainder of 2016. Shorter term, indices are still oversold. Chances are good that the bear market rally that started on Wednesday continues for days or possibly weeks. 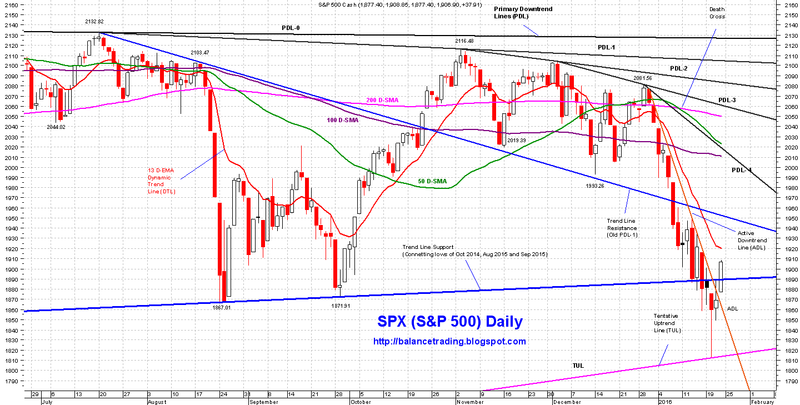 How far SPX retraces back its recent decline is a crap shoot. My best guess is that SPX could retrace back around 50% to 60% and test the resistance at 2000, especially if the Fed puts out an extremely dovish FOMC statement on Wednesday. I'm 100% in cash now and planning to start opening short positions (3 short positions in SPY) as SPX peaks around 2000.